Won’t Last A Day Without You Movie Poster and Music Video released! Check out the official music video and movie poster of the upcoming movie entitled “Won’t Last a Day Without You” top-billed by Sarah Geronimo and Gerald Anderson under Star Cinema. “Won’t Last A Day Without You” is said to be the sequel to Sarah and Gerald’s first movie “Catch Me…I’m In Love” which was the first box-office hit of 2011. Can “Won’t Last a Day Without You” surpass the P120.21 million box-office gross of their first team-up movie “Catch Me…I’m In Love”? 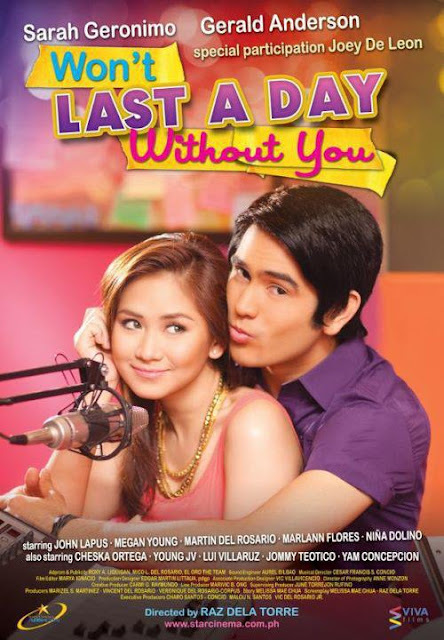 “Won’t Last a Day Without You” movie opens in theaters nationwide on November 23, 2011. Here is the Link where you can watch the full movie here "Won't last a day With out you"
Great News! Earn Money Using your Twitter & Facebook Accoount Sign Up HERE! 'Shake Rattle and Roll 13' Movie Poster and Trailer revealed! Binibining Pilipinas 2013 Official Candidates revealed!